You may be aware that the U.S. FTC, the European Commission and several U.S. state AGs are currently investigating Google’s anticompetitive search and search advertising practices. The FairSearch Coalition has recently sent a 44-pager paper, titled, “Google’s Transformation From Gateway To Gatekeeper: How Google’s Exclusionary And Anticompetitive Conduct Restricts Innovation And Deceives Consumers,” to all 50 U.S. Attorneys General. Their objective is clear and so are their concerns: They believe that Google is abusing its search monopoly to thwart competition. The FairSearch Coalition comprises of a group of businesses and organizations who have come together with the idea of promoting a healthy Internet future, where growth is driven by competition, transparency and innovation in search verticals and online services. The companies who aer involved in this initiatives are TripAdvisor, Travelocity, Kayak, Hotwire, Expedia, SideStep, Sabre Holdings, Microsoft, Zuli, Lecel and Foundem. Some select points from the 44 page report. So we had the five top finance sites in their order of their popularity listed there. We roll out Google Finance, we did put the Google link first. It seems only fair, right? We do all the work for the search page and all these other things, so we do put it first… But that has actually been our policy since then because of Finance. So for Google Maps again, it?s the first link. MapQuest, which in 2010 had only 32% of the market, down from 57% in 2007. earlier Google displayed links to MapQuest and Yahoo! Maps when a user searched for addresses or locations. In January 2007, the report claims, Google began to bias its search results by removing links to MapQuest and Yahoo! Maps, and instead inserting Google Maps as the top result. MapQuest?s usage share immediately began to drop drastically. Most of the “content” that Google provides in its sites such as Google Places, Google News, Google Maps is not generated by Google through its own investment. Google scrapes the content developed by other websites and displays it on a Google page, says the report. This enables Google to earn advertising revenues. The recent dispute between TripAdvisor, Yelp and others and Google is a case in focus. Recently, Google acknowledged that it manually manipulated its search engine results, sometimes on a site-specific basis, after denying for years that it engaged in the practice. There is little standing between Google manipulating its search algorithm to remove sites like Amazon, eBay, and Expedia from Google?s natural search results – even though those sites depend on Google for traffic. Some of it may be true and some of it may be biased or exaggerated, but the report nevertheless makes very interesting reading and offers some new insights and food for thought – so that you can reach you own conclusions. Do you thing Google its favoring its own properties like YouTube, Google Maps, Blogspot.com, Google Places, etc in its own search results? Do share in the comments below and let us know what you think of the search scenario. 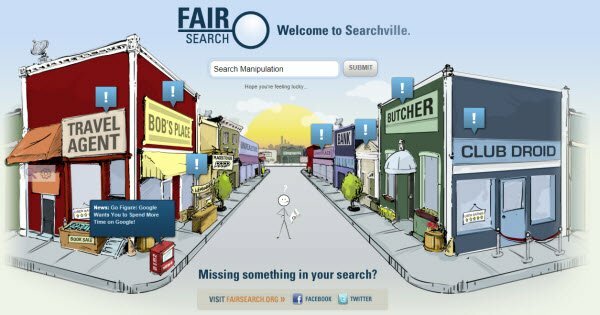 In any case, do visit FairSearch.org and check out SearchVille and other resources there.